Wouldn't it be nice to be able to turn your thermostat down when you leave home for work or travel, without having to come back to an uncomfortable environment, too cold or too hot depending on the season? And wouldn't it be even better if the thermostat knew how to schedule the temperature itself depending on whether you're home or not? Well, the first of these wishes can be achieved using a Wi-Fi supporting thermostat that can be controlled from your smartphone allowing you to set your home temperature remotely before you get back home. As to the second wish, it can be achieved using what is known as a "smart" thermostat that is able to evaluate the current conditions at home, including your presence, and operate optimally the thermostat so that energy savings are achieved while your comfort is not compromised. With a Wi-Fi supporting smart thermostat, you just need to use your smartphone, tablet or a computer to control it remotely and take advantage of the built-in smarts to save energy and money when you're away without compromising your comfort when you're back home. Using the associated app that is provided with these thermostats, you can virtually control all of your thermostat's settings, including the desired indoor temperature, humidity level, access permissions, fan activity, etc. Of course, these thermostats can also be controlled from the device itself using dials, buttons or simply a touchscreen depending on the particular brand. These were not just the most popular among Amazon customers at the time this article was written, but they had also received excellent reviews from most Amazon buyers (an average rating of 4.5 stars for each, out of 5 stars!). Nest has a high resolution color screen and is equipped with radial dials. The backlight color displayed is blue when it is working in cooling mode and orange when it is working in heating mode. A "leaf" is displayed when energy saving settings are chosen while adjusting the temperature. The menu is invoked by simply pressing the ring and turning the dial to SETTINGS. All three thermostats considered here support Wi-Fi and can be controlled remotely from your Android or iOS smartphone or tablet using the provided free apps. Once you connect your thermostat to Wi-Fi, the app will allow you to control remotely from anywhere virtually all of the thermostat settings, including the desired indoor temperature, humidity level, fan activation duration, access permissions, etc. Note that ecobee3 is compatible with Apple’s HomeKit, the program for syncing up smart home gadgets in iOS environment. The three thermostats considered here allow you to control the fan both from the device and remotely using the app. Most thermostats only read the temperature in one location of your home, whereas the ecobee3 thermostat uses multiple temperature readings from remote sensors to deliver comfort more reliably. The remote sensors are placed in various rooms of your home and they allow you to closely monitor temperature on a room-by-room basis. They also detect which rooms are occupied to deliver the right temperature in the right places. Unoccupied rooms can be automatically deprioritized for increased energy savings. ecobee3 comes with one remote temperature sensor, but you can add up to 32 additional remote sensors as required (see Amazon product section below for additional remote sensors). They make the screen data on the device brighter and more visible as they detect human activity in the room. This allows you to spot and read the thermostat display at a distance. They schedule thermostat activity based on human occupancy to save energy. See note 6 below for specific details on how this is achieved by Nest and ecobee3. Nest Thermostat learns about your house. Like how long it takes to warm up, how drafty it is, and what the weather’s like. It also learns about your heating or cooling system and how to make it even more efficient. So while you turn up the thermostat or turn it down, Nest algorithms are figuring out a thousand things in the background. In addition, the third-gen iteration of Nest’s heating and cooling control system relies on built-in near-field and far-field activity sensors as well as ambient light sensors to track your whereabouts. All that information is used along with algorithmic smarts to create a custom, auto-adjusting temperature schedule based on the conditions and movements in the home. And you can still make manual tweaks to your settings either directly on the device or remotely using the Nest app anywhere you have a Wi-Fi or cellular connection. You can set Nest to Home or Away from the app, or if you forget to do it, Nest will set itself to Auto-Away which uses built-in sensors to make sure you’re not home and will adjust the temperature accordingly. This avoids wasting money heating or cooling an empty house. ecobee3, like Nest, learns also about your home and your energy usage patters to create a custom, auto-adjusting temperature schedule. But the ecobee3 algorithmic smarts include a new element: the remote sensor. Most thermostats read the temperature in just one room (usually the hallway) and use that information in making temperature adjustments for the whole home. That may not always work well, as some rooms may not be sufficiently heated or cooled. To avoid this situation, ecobee3 uses remote sensors placed in those rooms that matter most. These sensors collect local temperature and occupancy data which they communicate to the main thermostat over radio frequency. The main thermostat in turn uses this information to operate the HVAC until the average temperature across those rooms equates to the set point. Note also that these remote sensors can detect when a room is empty and therefore unoccupied rooms can be automatically de-prioritized, for increased energy savings. Like with the Nest thermostat, you can set the ecobee3 to Home or Away modes. If ecobee3 senses that you are home during your scheduled Away period, or away during your scheduled Home period, it will automatically override your schedule to maximize comfort and savings. ​Honeywell Smart learns your heating and cooling habits and cycle times, then optimizes to deliver the right temperature at the right time based on your energy usage patterns so energy isn't wasted and your comfort isn't compromised. At any time, you can of course override the automated schedule by manually setting the temperature. But there is no occupancy based decision made here, as there are no human presence detecting sensors. Each of these three thermostats allow manual modification of the learned schedule directly on the device or using the associated free app. Nest: You can enter as many temperature schedules as you need for any day of the week. Nest also allows you to enter "range" type schedules: You enter two numbers say 68 and 78. If the temperature falls below 68, it starts heating and if it rises above 78 it starts cooling. Honeywell: Four settings per day are allowed (Wake, Leave, Return, Sleep). Also, each day of the week can be independently scheduled, although most people set Monday through Friday using one schedule and Saturday/Sunday using a different schedule. Both Nest and ecobee3 allow you to check your energy usage history when you log into your secure account from the app, making it easy to track your heating and cooling usage, estimated energy savings, and more. All three thermostats considered here can display the current weather conditions in some form or other. All three thermostats considered here send alerts to your Wi-Fi enabled smart device to indicate specific situations such as high/low temperature conditions, specific system states, HVAC filter change reminders, etc. The sunblock feature found on Nest senses when the thermostat starts heating up in direct sunlight and will automatically adjust so it still reads and sets the right temperature. All three thermostats considered here can be locked and assigned a 4-digit PIN or password to unlock. You can lock the thermostats from the app or from the device itself, and you can unlock it from the device if the Wi-Fi is out. Nest uses a buit-in lithium-ion battery. The battery is rechargeable and is suppose to stay charged through the heating and cooling system wires. If needed, it can also be charged using the USB port on the back of the device. The ecobee3 thermostat does not require any battries, but the ecobee3 remote sensors are powered by a CR2032 coin cell battery which should last about 4 years. ​Honeywell Smart does not use batteries. Do you see 110V or higher written anywhere? If the answer is "YES", then your system IS NOT compatible with the Honeywell Smart. Do you see thick wires connected with wire nuts? If the answer is "YES", then your system IS NOT compatible with the Honeywell Smart. Do you see a wire connected to terminal labeled as "C"? If the answer is "YES", then your system IS compatible with the Honeywell Smart. "C" wire is required for the Honeywell Smart to work, as it needs power to keep the back-light and Wi-Fi connection on. If you don't have a wire labeled "C", but have a wire labeled "G" connected to terminal, then you can use the "G-to C" workaround to install the thermostat. Once you confirm compatibility of these thermostats, installation can be done following the instructions provided in their user manuals or in videos that can be found on their websites. If you don't feel at ease doing it yourself, you should of course get an electrician to do the job. So which of the three thermostats to buy? The three smart Wi-Fi thermostats considered here are excellent products as shown by the average rating each had received from Amazon customers at the time this article was written. Indeed, all three had received a whopping 4.5 stars (out of 5 stars)! There is a good chance that you would be quite happy with any of these three products. ecobee3 is the only one that uses remote sensors that can be placed in multiple rooms and that provide temperature and occupancy information to the main thermostat so that the latter can make more optimal decisions to assure energy savings as well as maximum comfort in every room that counts. Also, iOS equipment users who have Apple's HomeKit already installed in their homes may find the ecobee3 a natural add-on to their home automation system. Though Nest does not make use of remote sensors, it is equipped with a large number of sensors to detect near-field and far-field human activity, ambient light, temperature and humidity, which it uses to efficiently operate the thermostat to achieve optimal comfort and energy savings in the areas accessible to the sensors, even though the conditions in rooms that are isolated from the thermostat's vicinity may not always reach the ideal comfort levels. So, if you think that the structure of your home is such that the remote sensors will be a useful feature to assure optimal comfort in all rooms, you might want to consider ecobee3. Otherwise, Nest, with its exceptional performance, feature list, usability and overall design will surely won’t disappoint you. 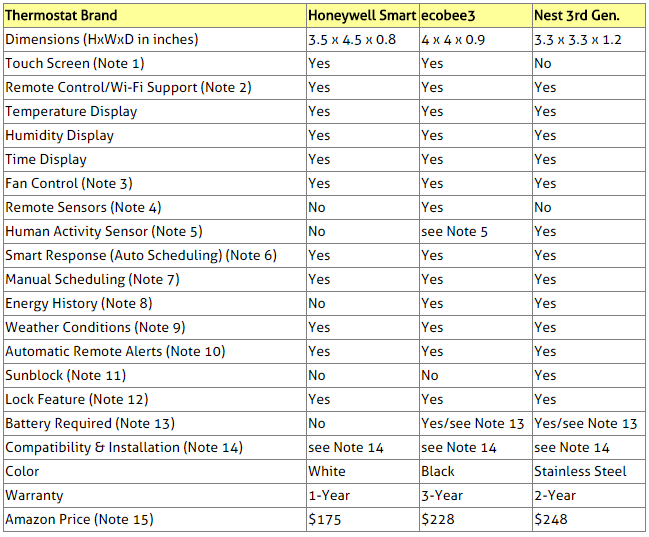 When compared to Nest and ecobee3, the main deficiency of Honeywell Smart is the lack of human occupancy detecting sensors (whether builtin or remote). Otherwise, it comes with a rich unique set of features such as its customizable color touchscreen. Please click the Wi-Fi thermostat of your choice below for price information or to purchase.